WHILE many families were at home preparing for Cyclone Marcia, one Gladstone couple was at the hospital ready to welcome their first child. 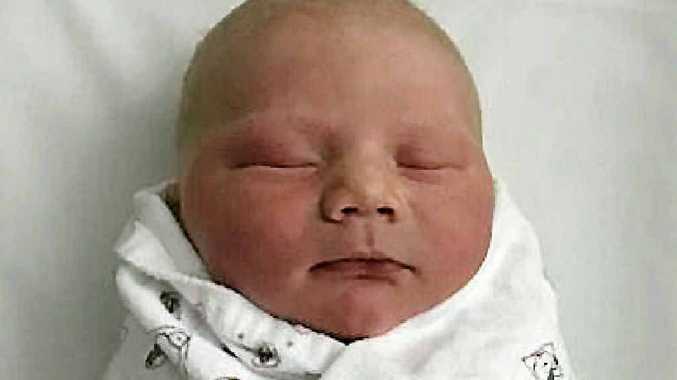 On February 20, George Stephen Thorpe was born two weeks premature, to parents Sarah Richardson and Jack Thorpe. The Category 4 cyclone forecast to hit the Gladstone region meant there had to be changes to the original birth plan. "The power had gone out and they only had two heat packs for pain relief and no hot water for a shower," Ms Richardson. Ms Richardson was the only mother-to-be at the Gladstone Hospital that night. "I would like to make a special thanks to the midwives, Lauren and Theresa. They were very helpful." She said George was a good baby, always smiling and eating. Ms Richardson shared her story and photos of George when The Observer put the call out on our Facebook page for people to send in photos of their newborns. You can check out a two-page spread of the photos in Saturday's Observer.